SAKHEE'S SECRET (GB) (Chestnut 2004-Stud 2009). 5 wins-1 at 2, Newmarket July Cup, Gr.1. Sire of 468 rnrs, 242 wnrs, inc. SW Sakhee's Soldier (ARC New Zealand S., Gr.1), Salford Secret, Wick Powell - Elite Power (Sing. ), Fine Blend, Cryptic, Thunder Strike, Twoznotenough, SP Pretorian, Coming Soon, Just Like Fire, Mystery Show, Snow Secret, Secret Agent, Eagleway, Spina di Rose, Family Secret - Aotearoa (Sing. ), It's the Ice, Rabiosa Fiore, etc. Major Tom (Sing.) (g. by Darci Brahma). 3 wins at 1200m, 1400m in 2017, Singapore TC Novice P., Initiation P., Class 4 H.
Gijima (g. by Red Ransom). 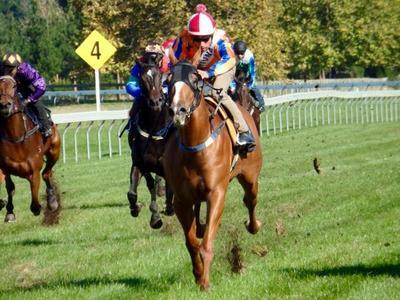 3 wins from 1400m to 1600m in NZ. Jacks Secret (g. by Sakhee's Secret). 2 wins. See below. Eclair Lightning (g. by Darci Brahma). Winner at 1200m in 2017-18 in Aust. SPIN 'N GRIN (Spinning World). 2 wins. See above. MR SMUGG (Spectacular Love). 7 wins from 1500m to 2200m, A$215,275, QTC Ramsay Health Care H., L, BTC Unilever Foods Australasia H., Gilshenan & Luton Lawyers H., QTC Queen Street Mall H., Primus Mobiles H., Limerick H., 2d GCTC Prime Minister's Cup, Gr.2, QTC Easter Cup, L, BTC Jim Byrne H., QTC Anchor In H., Marsh Congratulates Terrace 125 Years H., 3d SCTC Caloundra City Cup, L, 4th Ipswich Cup, Gr.3. Heart. 8 wins-1 at 2-to 1200m, A$181,105, BTC Jacob's Creek Sparkling H., MRC Keilor TAB Agency H., Townsville TC Cleveland Bay H., 2d BTC More Fun If It's Your Racehorse H., Qld Tatt's RC Carlton Draught P., 3d Alice Springs TC Pioneer Sprint H., BRC Optimum Recruitment H., MRC Dark Purple H.
Leka Secret - Q Nine Marvel (Mal.) (Sakhee's Secret). Winner at 1400m in Malaysia, 3d SAJC Oaklands P., L.
Sleek Secret. 5 wins to 1500m, NZ$75,300, to 2017-18, 2d ARC Curraghmore H., Manawatu RC Silvester Clark Engineers H., WRC Pete's Joinery H., 4th CJC Inglewood S., L.
A Little Smugg. 2 wins at 1400m, 1750m, 2d MRC Wynette H., Our Faith H.
Emoticon. 7 wins from 1000m to 1650m, A$156,750, 2d Toowoomba Cup, Qld Tatt's RC Total Sports Travel H., Tattersall's H., BRC Channel Seven H., 3d BRC David Jones H., Sky Vision in Apps H.
Grinstone. Winner at 1550m in Aust. Aldolphin. 5 wins from 1600m to 2300m, A$88,675, to 2017-18, 2d MRC (Mornington) BMK H.
Invincible General. 2 wins at 1800m, HKJC Robert Black College H., Tak Wah H., 2d HKJC Peacock H., Seattle H., 3d HKJC River Humber H.
Rocknrolla (Towkay). 8 wins at 1400m, 1600m, NZ$130,285, to 2016-17, Whangarei RC Northpine Waipu Cup, BOP RC CU at Greer's Gastro Bar H., Whangarei RC Ford Focus H., 2d Whangarei RC ITM & GIB H., Avondale JC Hickey Family H., 3d Egmont RC Taranaki Breeders S., Gr.3, ARC Puhoi Valley H., Rotorua RC Metalcraft Roofing H.
HAPPY BID (Spectacular Bid). 2 wins at 2, Arlington Park Primer S., L, 3d Arlington Park Joliet S., L. Sire. Winning (Nijinsky). 3 wins-1 at 2, 2d Monmouth Restoration S., L. Sire. NATIVE SONG (Mellifont). 6 wins at 1600m, 1800m, NZ$154,888, WRC Wellington S., Gr.3, 2d Wanganui S., L, Feilding JC Anzac H., L, 3d Waikato RC Gasmate S., Gr.2. Producer. SAVABILL - HAPPY HA HA (H.K.) (Savabeel). 3 wins at 2, NZ$91,775, HK$441,000, Matamata RC Slipper S., L, 3d ARC Eclipse S., Gr.3. MASTER RICK (Master Command). 5 wins at 1m, 8½f, US$547,113, Lone Star Park H., Gr.3, Lone Star Park Texas Mile S., Gr.3, Oaklawn Park Northern Spur S., L, 3d Louisiana Downs Super Derby, Gr.2. DILIGENT PROSPECT (Diligence). 7 wins-2 at 2-to 7f, US$227,174, Fairplex Foothill S., L, Turf Paradise Swift S., L.
GAILY FUNKY (Theatrical). 2 wins at 2, Niigata Sansai S., L, 2d Hanshin Juvenile Fillies, L. Producer. RISING ROMANCE (Ekraar). Top Filly of 2013-14 Australasian 3YO Classification (Long & Extended). Joint Top Filly on The 2013-14 NZ 3YO Free H (1600m+). 5 wins from 1400m to 2400m, NZ$311,200, A$1,970,000, Australian Oaks, Gr.1, ARC Royal S., Gr.2, 2d MRC Caulfield Cup, Gr.1, New Zealand Derby, Gr.1, ARC New Zealand S., Gr.1, MRC Memsie S., Gr.1, VRC LKS Mackinnon S., Gr.1, Makybe Diva S., Gr.1, ARC Avondale Guineas, Gr.2, ATC Epona S., Gr.3, 3d VRC Australian Cup, Gr.1, ARC Eight Carat Classic, Gr.2. ABLE ONE (Cape Cross). Champion Miler in Hong Kong in 2010. 11 wins from 1250m to 1600m, A$14,300, HK$37,755,000 in Aust. and HK, HKJC Champions Mile, Gr.1-twice, Cathay Pacific Hong Kong Mile, Gr.1, Cathay Pacific Jockey Club Mile, Gr.2, Chairman's Trophy, L, Premier Cup, L-twice, Dubai Racing Club H., Daffodil H., Hanshin H., 2d Cathay Pacific Hong Kong Mile, Gr.1, HKJC National Day Cup, L, Mission Hills Sha Tin Trophy, L, 3d HKJC Chairman's Trophy, L.
FLORILEGIUM (Cape Cross). 5 wins-2 at 2-to 1400m, NZ$43,750, A$114,530, Counties Challenge S., L, 2d ARC Eclipse S., Gr.3. SHAMOLINE WARRIOR (Shamardal). 3 wins-1 at 2-from 1200m to 2000m, A$205,375, MRC Norman Robinson S., Gr.3, VRC Super Impose S., L, 2d MRC New Litho H., 4th MRC Vain S., L. Sire. CADILLAC MOUNTAIN (Reset). 4 wins from 1500m to 2600m, A$296,295, Werribee Cup, L, 2d MVRC Alister Clark S., Gr.2. HAYBAH (More Than Ready). 3 wins-2 at 2-to 1200m, A$153,880, SAJC Cinderella S., L, 2d MRC Blue Diamond Preview (f), Gr.3. ANWAAR (Secret Savings). 8 wins to 1400m, A$434,450, AJC Hall Mark S., L, 2d AJC Villiers S., Gr.2. BLACK AND WHITE (Mutawaajid). 15 wins to 1400m, 982,203Rgt., to 2017 in Malaysia, Selangor TC Sports Toto Grand Challenge Trophy, L, 2d Penang TC Malaysian Magic Millions Classic, L.
CAT D'ANTIBES (Tale of the Cat). 2 wins at 2, A$185,800, GCTC Ken Russell Classic, L, 3d BTC Champagne Classic, Gr.2. EXIMIUS (Exceed and Excel). 6 wins-1 at 2-from 1000m to 1600m, A$495,405, to 2016-17, Sunshine Coast Guineas, L, VRC Hilton Hotels S., L.
MOSSFUN (Mossman). Joint Top Filly of 2013-14 Australasian 2YO Classification. 4 wins at 2, A$2,561,250, ATC Golden Slipper S., Gr.1, Silver Slipper S., Gr.2, Widden S., Gr.3, Inglis Nursery, RL, 2d ATC Reisling S., Gr.2, Birthday Card S., Gr.3, 4th ATC Royal Sovereign S., Gr.2. MAWAHIBB - ARAMCO (Sing.) (Magic Albert). 6 wins-1 at 2-at 1200m, 1400m, A$107,675, S$360,573, to 2018 in Aust. and Singapore, Singapore TC Rocket Man Sprint, L, 3d Singapore TC EW Barker Trophy, L.
TRUSTEE BROWN (Oratorio). 7 wins from 1100m to 1800m, A$301,225, WATC Detonator S., L, 3d Kalgoorlie Boulder RC Hannan's H., L.
FAST FLYING (Distorted Humor). 9 wins from 1400m to 2400m, 1,416,591Rgt. in Malaysia, Perak Derby, L, Selangor TC Piala Emas Sultan Selangor, L.
Race Record: 30 Starts 2-8-3 S$136,119. 2 wins at 1200m, 1600m to 2018, Singapore TC Class 4 H., Lim's Cruiser S., 2d Singapore TC Flax S., Class 4 H.-twice, Kranji D S., Class 5 H.-3 times, 3d Singapore TC Initiation P., Class 4 H.